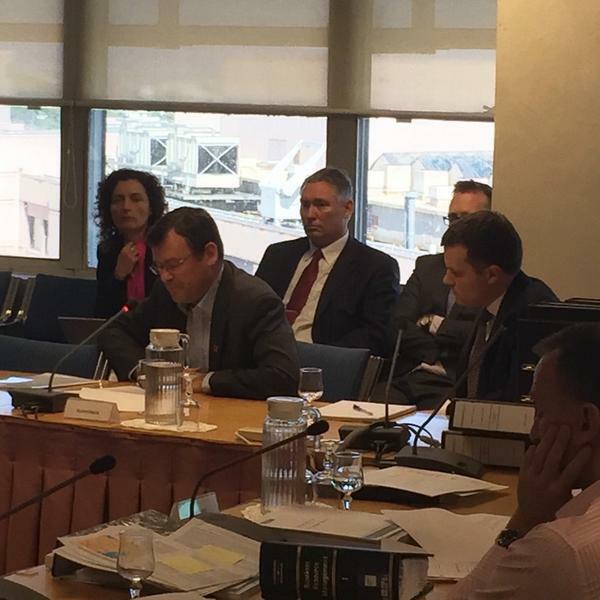 It was fortuitous – having just completed two days of RMA hearing training the day before – to attend a full day of hearings on the 6th of November regarding a matter on which the Waitematā Local Board was the main submitter in opposition. Before and after as modelled by AT. 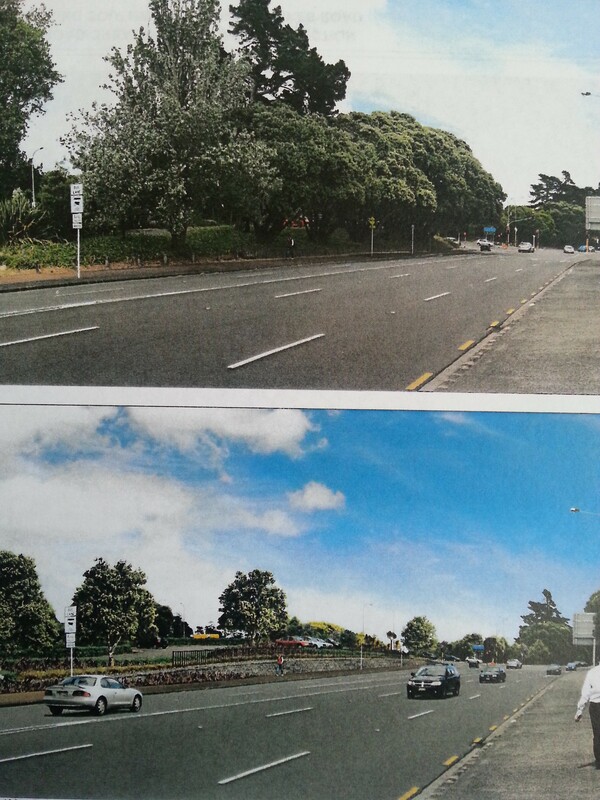 AT propose the removal of six mature Pohutukawa trees from the side of Great North Road on either side of the St Lukes intersection. There is a good summary (including a one-minute video) here. This is to allow for two lanes of traffic to turn on to the North Western Motorway on the eastern side of the St Lukes bridge intersection. The site is on the Local Board’s boundary with the Albert-Eden Local Board and on the western side of the intersection the boundary runs along Great North Road as far as Motions Road. The reserve in which the trees stand, 820 Great North Road, is Parks land and the Waitematā Local Board is the landowner. AT are the notifying authority under the Resource Management Act 1991 (RMA) and they are acquiring the land for the works by way of a Notice of Requirement (NOR). The Local Board decided to bring a NOR objection. We retained counsel from Nick Whittington of Meredith Connell, funded by Council with expert witnesses paid for by the Local Board. Photo credit: public address blog. A Notice of Requirement is what a designation is called before it is confirmed. It gives notice of an intention to use land in the future for a particular development. When confirmed, it is included in a district (or unitary) plan, often as a listing or schedule, with any associated conditions that provide for the work and set out any particular way in which effects are to be avoided, remedied or mitigated. Only a requiring authority can require a designation to be provided for in a district or unitary plan. The requiring authority in this case is Auckland Transport (AT). A board of independent commissioners was convened to conduct hearings and they will make a recommendation to the requiring authority but ultimately, the decision is AT’s alone and they can theoretically disregard the recommendation of the board of commissioners. Because of an error communicated among public submitters, the wrong file number was written on no less than 54 of the public submissions. There were two applications related to these works: one, a resource consent hearing, for the additional stormwater works required with a significant increase in impermeable area when the trees are removed; the other, the notice of requirement for the roading designation. One of the submitters accidentally put the number for the resource consent on their submission and communicated this to many other submitters who likewise accidentally submitted on the wrong application. Oddly, though, four submitters who didn’t put any number on their submission was accepted as having validly submitted. The consequences of these simple clerical errors have threatened to overshadow the legitimacy of the NoR hearing and have been widely reported. Jolisa Gracewood has written about it at length. On the second day, when opposing submissions were heard, only three members of the public were heard by the Board of Inquiry. One of these submitters was told that she would be heard but that her submissions would not be mentioned in the final report and could not legally be considered by the Board. The Local Board’s submission centred on the consideration that AT had given to ‘Option 6’ of the configurations of the intersection considered by the agencies. In their analyses of the St Lukes Road upgrade, the New Zealand Transport Agency (NZTA) and AT identified the provision of one or two westbound lanes turning left from Great North Road to St Lukes Road. This was to address queuing issues during the evening commuter peak period. AT and NZTA concluded that two lanes would be required which would necessitate the removal of the six Pohutukawas. This option was included in the July 2013 application to Auckland Council. Auckland Council Parks, Sport and Recreation (Parks) and the Waitematā & Albert-Eden Local Boards raised concerns about this approach and observed that the option of removing one of the three eastbound lanes Great North Road immediately east of the interchange had not been considered. In March 2014 another analysis was undertaken by Beca looking at this option. It noted that traffic performance had been considered but not geometric, consenting and safety issues. An Aurecon review in May 2014 again considered this option along with the five that had already been proposed and referred to it as Option 6. 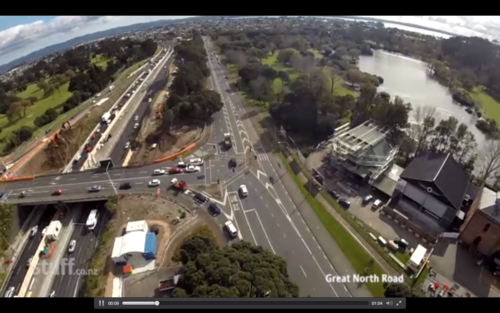 Option 6 proposes two eastbound lanes in Great North Road for the first 135m from the interchange. After that the traffic lanes would divide into the existing four lane arrangement approaching the Stadium Road intersection. The modelling in the Beca report shows that there are only marginal differences between the two and three lane treatments. But the assessment in that report challenged by the Local Board’s expert witness, David Mitchell, is that in ‘non-typical’ situations the three-lane layout ‘provides much greater flexibility and resilience.’ In the view of Mr Mitchell, it is ‘extremely unusual to include redundancy in a transport network simply to ease congestion from a non-typical incident on the motorway such as a crash.’ He goes on to cite other evidence that this is not an approach that has been taken in other parts of Auckland concluding that ‘Option 6 appears to have been discounted not because it doesn’t meet with project objectives, but solely because of an apparent desire to introduce redundancy into the transport network.’ Not only would Option 6 leave the trees in place, it would also be less expensive to build. The statement of Local Board Chair, Shale Chambers, is here. The Chair of the Board of Independent Commissioners, Leigh McGregor, asked submitters if they had any proof to verify the oft-repeated claim that the trees were planted as a public works project during the Depression. In a fantastic piece of twitter-sourced research, Jolisa Gracewood was quickly furnished by Phillip Lyth with this historic newspaper article which showed (although not incontrovertibly) that trees had been planted in the area in the 1920s. The Requiring Authority (AT) needn’t weigh the alternatives against each other or even demonstrate that the one they have chosen is objectively the best. All they need to demonstrate is that other options have been considered. The Requiring Authority has the final say, not council. Furthermore, the legislation is very permissive regarding large infrastructural projects of this nature. It’s in the hands of the independent commissioners now and we’re told that we’ll have a decision by 17 December. UPDATE: The Hearing Panel has recommended that the trees be removed. This entry was posted in Auckland Council and tagged auckland council, Auckland Transport, Great North Road, NZTA, pohutukawa. Bookmark the permalink. 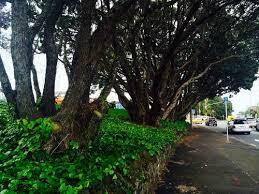 Update on the Pohutukawa at St Lukes Road Interchange by Vernon Tava.